Inspired by the mechanics of the body’s own immune system, researchers at the Wyss Institute for Biologically Inspired Engineering at Harvard University created a nanosized robot made from DNA that could potentially seek out specific cell targets within a complex mixture of cell types and deliver important molecular instructions. Boston, Massachusetts — Researchers at the Wyss Institute for Biologically Inspired Engineering at Harvard University have developed a robotic device made from DNA that could potentially seek out specific cell targets within a complex mixture of cell types and deliver important molecular instructions, such as telling cancer cells to self-destruct. Inspired by the mechanics of the body’s own immune system, the technology might one day be used to program immune responses to treat various diseases. The research findings appear in today’s issue of Science. The programmable DNA nanorobot was modeled on the body's own immune system in which white blood cells patrol the bloodstream for any signs of trouble. By combining several novel elements for the first time, the new system represents a significant advance in overcoming these implementation obstacles. For instance, because the barrel-shaped structure has no top or bottom lids, the payloads can be loaded from the side in a single step–without having to open the structure first and then reclose it. Also, while other systems use release mechanisms that respond to DNA or RNA, the novel mechanism used here responds to proteins, which are more commonly found on cell surfaces and are largely responsible for transmembrane signaling in cells. Finally, this is the first DNA-origami-based system that uses antibody fragments to convey molecular messages — a feature that offers a controlled and programmable way to replicate an immune response or develop new types of targeted therapies. 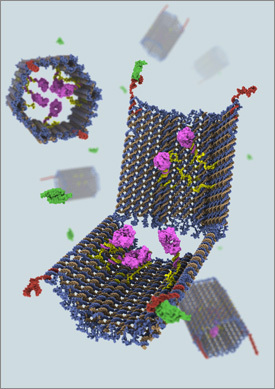 Be the first to comment on "Researchers Develop DNA Nanorobot to Seek Specific Cell Targets"